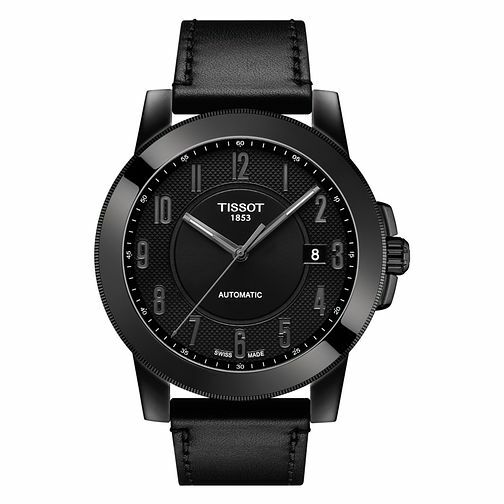 Tissot presents a modern Swiss-made timepiece with a black ion plating, industrial numerals and secured with a black stitched strap for more comfortable wearing. Tissot Gentleman Automatic Men's Black Ion Plated Watch is rated 4.0 out of 5 by 1. Rated 4 out of 5 by Anonymous from A watch with understated beauty. A great looking watch, could be worn with T shirt as it could a suit. Very understated and stealthy. Great build quality from a great maker. Strap poor, stiff and looks cheap. changed mine instantly for a worn leather one looks far better. Fine hands so may b difficult to see and no lume on numerals add to difficulty especially in low light. Red hands would improve the look so much in my opinion and solve all the minor problems. Still a lovely watch and would recommend if looking for a unisuming timepiece.